Welcome back to our comprehensive guide on How To Be A Master Chef for beginners and food enthusiasts! In today’s posts, we’ll go over the most important meal of the day: breakfast! Learn how to properly eggs and morning meats! proper braising & stewing techniques, as well as how to properly spice your foods. If you’ve ever wanted to be a master chef, the time is now, so let’s get started! Did you miss our guide on baking? Learn how to make Pies, Cakes & Quick Breads like a master baker! Learn how to make the most important meal of the day: breakfast! 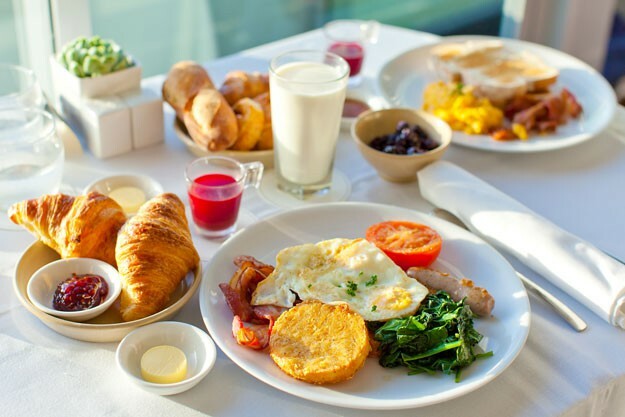 Breakfast… the most important meal of the day! This meal is vital in giving you the energy you need to do what you need to do throughout the day, meaning you should probably know how to cook it. In this post, you will learn to cook farm-fresh eggs, morning meats, and bread. 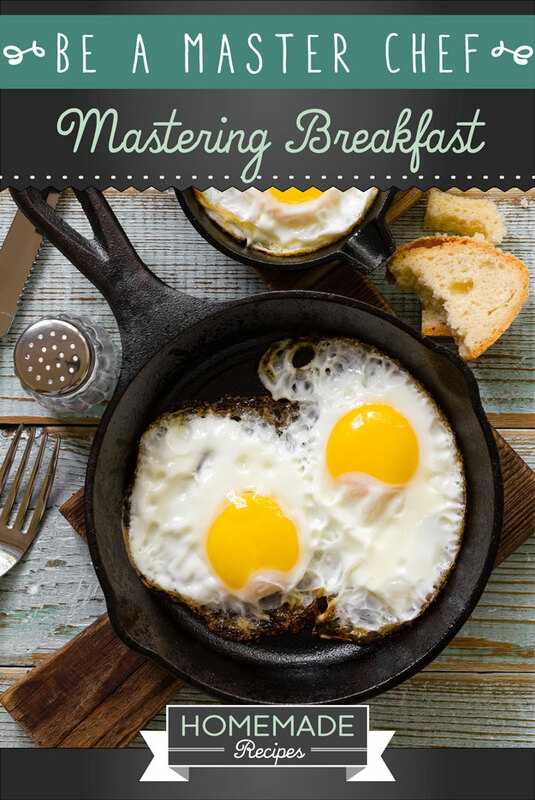 Read on to become a breakfast master! These are the best start to any morning! Packed with protein, eggs are great for anyone who enjoys a savory breakfast. This section will go over the different specialty eggs and how to poach, fry, boil, and fold them! Free-Range Eggs: These eggs are exactly how they sound. The mothers (hens) are given a bit of freedom. Most of the chickens on free-ranges do not even leave the buildings on the property, meaning there really isn’t much of a difference. These chickens are not in cages, meaning they probably have a higher quality of life, but the eggs don’t really taste any different. Eggs With Added Omega-3s: Omega 3s are fatty acids that are supposed be beneficial to heart health. These eggs also have a higher vitamin E content. The hens are given a diet that is higher in omega-3s, giving their eggs more of the healthy fats we need. Organic Eggs: The chickens making these eggs are not given any drugs, antibiotics, animal byproducts, or hormones. Some believe that this makes the eggs safer and purer. A lot of people also claim the eggs are more nutritious, but there is not a lot of evidence proving this to be accurate. Scrambled: Mix up the raw eggs in a bowl, pour some milk in the mix, butter a skillet and cook until they firm up. This takes only a few minutes, and the result is delicious. Toss some cheese on them while they are cooking for some added flavor! Fried: Break an egg into a hot, oiled skillet and allow it to cook until it is firm. The whites will turn a solid white, and the yolk can be cooked until you feel it is cooked to your preference. You can also place a lid over the skillet to make the egg cook faster. Poached: These are cooked in boiling water. To poach an egg, you will need a saucepan and a slotted spoon. Fill the saucepan halfway with water and bring it to a simmer. Add a tablespoon of white vinegar to the water once it is simmering. Next, break an egg into a cup or bowl. Stir the water with the slotted spoon to create a whirlpool in the saucepan. As it is being stirred, gently pour the egg from the cup into the middle of the whirlpool. Allow this to cook for 3 minutes and take the egg out with the slotted spoon. This is best served on an English muffin or toast. Boiled: Hard-boiled eggs are delicious and easy to bring as a snack. To see how to cook a hard boiled egg, look at Chapter 5. Folded: Folding omelets is not only pretty, but easy as well. Cooking an omelet properly will result in a smooth outside with a moist center. Add anything you want to add into your fold. Simply take scrambled eggs, coat a hot pan with them. Once they are firm enough, add your ingredients and fold it over using a spatula. We love the meats! What’s breakfast without bacon, sausage, ham, and any other greasy delicious meat you can think of? This section will go over how the breakfast meats and how to cook them. Crispy, smoky bacon can make any meal better. Traditionally known as a breakfast meat, this meat goes well with eggs, but it goes great with anything! There are many different types of bacon, so just choose one that meets your tastes (we love maple bacon!). Most people fry their bacon by putting it on the stove. When frying, make sure to do it on low heat to avoid grease splatters. Also, this should ensure it won’t burn. Once it looks like it is getting crispy, flip it and cook the other side. If you want to bake your bacon, put it on a baking pan in a preheated 400-degree oven for 10 to 15 minutes. The bacon should be good to go. You can also microwave bacon (although we don’t recommend it). Put the bacon between paper towels on a microwave-safe plate and put it on high for a minute per slice. Patties, links, and crumbles… oh my! 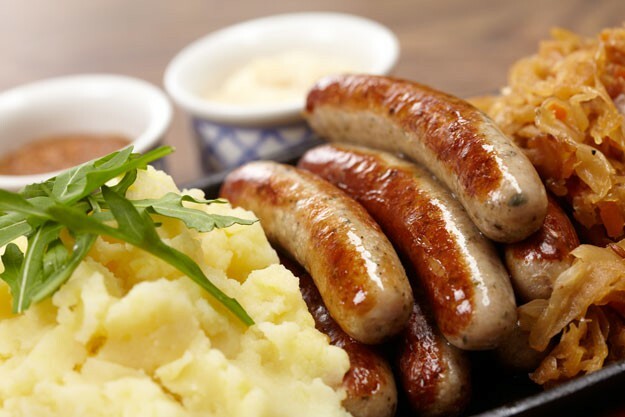 Breakfast sausage is the perfect add-on to your breakfast. It is fatty, delicious, and well-spiced. Fry links and patties in a skillet over medium heat and turn them every couple of minutes. Once the surface is golden brown, and the center is brown and hot, they are done. Steak Is Never A Mistake! Beef for breakfast? Yes! Small steaks are great with eggs and provide a ton of calories to get you through a rough day. Serve the steak up with some eggs and hash-browns and you’ve got yourself a breakfast! Great breakfast means you have to have great coffee! Learn how to make pour over coffee with this Pour Over Coffee Brew Guide for Beginners!